I have a confession to share with you. I love the food blogging world. I cannot even imagine what I would do without the support of this rare group of foodies who share the same passion. Before I even pick up a cookbook to look for a recipe, I always check out my list of trusty food blogs. Or I send out a tweet, and someone always has a great suggestion. Maybe one of their own recipes or one belonging to someone else such as this recipe I am sharing for Grandma’s Homemade Lentil Soup. I met Jen of My Kitchen Addiction, about a year ago, via Twitter. We connected in person at IFBC during the summer of 2010. I admired her eagerness and the fact that she is able to balance a great food site as well as a full-time job, and a “life”. Jen took on a new task and started the Kitchen Bootcamp, which is a virtual cooking event, where foodies come together and work their way through the Professional Chef. The Professional Chef is a go-to book for all the basics. Since receiving my copy, I cannot imagine, not having this reference point to go to when I need to learn the “right way” to do something. I have been wanting to participate in the Kitchen Bootcamp, since it began but have not had the time. I thought it was a great way to learn techniques that I could apply to my everyday cooking. As well it would be fun to participate with a group of like-minded foodies. Fast forward to January 2011; I have made it a goal to make time, join in, and learn something new with everyone who is participating. January’s challenge is soup. I am pretty confident when making soup as it is basically a staple in our house. Since I make my own stock, I decided to pick a technique and choose the Mirepoix. A Mirepoix is a combination of 2 parts onion, 1 part celery, and 1 part carrots. You want to make sure you peel the onion as the paper will give your stock an orange tint. As well you need to make sure the pieces are cut to uniform size and style. This is the part that would challenge me. I can be a bit lazy when it comes to mincing and dicing. I just cut and cook. This time I took my time and prepared the ingredients of my Mirepoix to be exact; almost all were exact. I did not use oil when I cooked my Mirepoix; instead, I added minced bacon (small size of my veggies); this technique is called a Mirepoix a Gras. I cooked my Mirepoix until it was caramelized and then I stirred in a small amount of tomato paste, to add some depth. The entire process from washing to the point of adding the remaining of the ingredients only took approximately 40 minutes. The Mirepoix was very flavorful and added a flavorful base for my Grandma’s lentil soup recipe; I was thrilled with the flavor of my Mirepoix. From now on, I will pour myself a glass of wine, turn some music on and take my time with making my Mirepoix. Be sure to check out Jen’s site for a round-up of all the delicious soups that were made during this cold January. Have you joined The Kitchen Bootcamp? If so, what soup did you make for the January Challenge? If not, what are you waiting for? Cut the bacon, onion, carrot, and celery into a small dice; uniform size. In a dutch oven, over low heat, add the bacon and the onion. Cook until slightly soft and the bacon will not be crisp, but cooked; about 10 minutes. Stir every so often. Add the carrots and celery; continue to cook over medium-low heat, until caramelized, about 15 minutes. Lower heat to low and stir in the tomato paste. Season to taste with salt and pepper, to taste. Add the lentils, stir. Add the stock, stir, raise the heat to medium. Bring to a boil, then lower heat to a low simmer. Cook until lentils are soft but not mushy; about 30 minutes. Garnish with a little parsley. 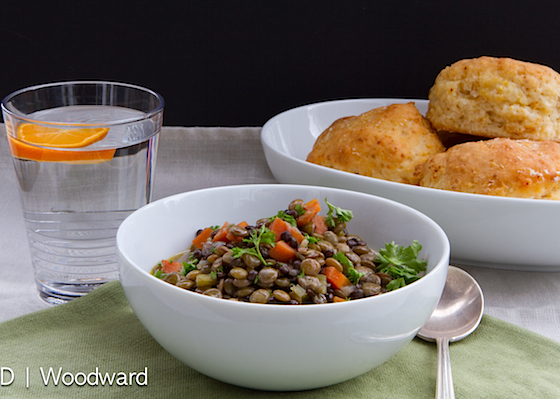 10 Responses to "Grandma’s Homemade Lentil Soup"
I always enjoy a good bowl of lentil soup. Fantastic recipe! With some irony and a chuckle; I just commented to someone about an hour ago how I hate taking pictures of brown soup and it's kept me from making my favorite lentil soup! See how you are...this looks very inviting and not at all like the Mississippi River mud I imagine mine would more closely resemble. Now I'm REALLY dying for it...and have an excellent reference point on how to make it look appealing. Thanks! I just finished a big bowl of lentil stoup, similar to your recipe. I made mine with smoked ham hocks gree and yellow bell peppers. Comfort food for a cold day. 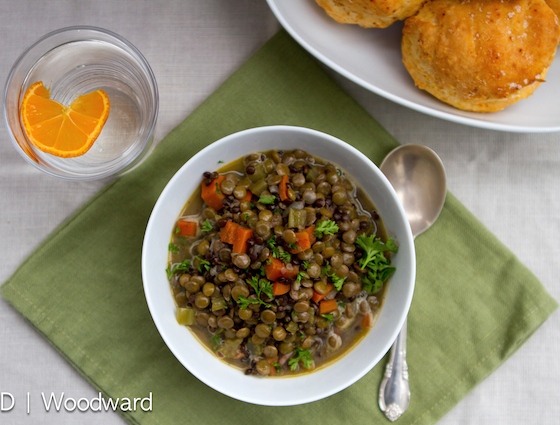 Lentil soup is a must make during the wintertime at my house. I like your addition of beluga lentils, I've been really into those lately. I agree with Barb that this photo really makes you want to slurp up the whole bowl. Always looking for a good lentil soup recipe and this one is now bookmarked.